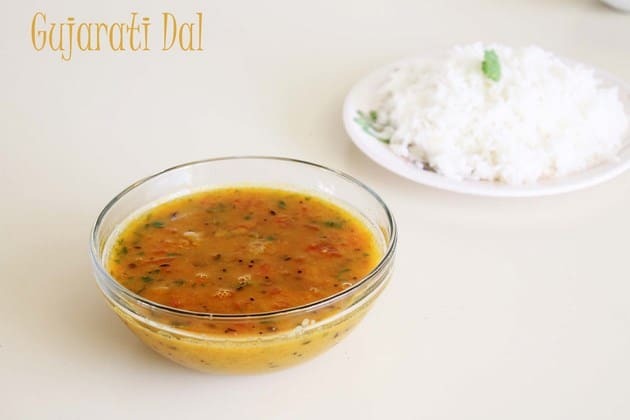 Gujarati dal recipe – healthy and comforting dal recipe made from tuvar dal/arhar dal. It is staple food in every Gujarati household. This is famous for its spicy, sweet and sour taste. It has thin consistency but it is full of flavors. The ingredients list may look lengthy. Don’t get scared. It is very easy to make, trust me. 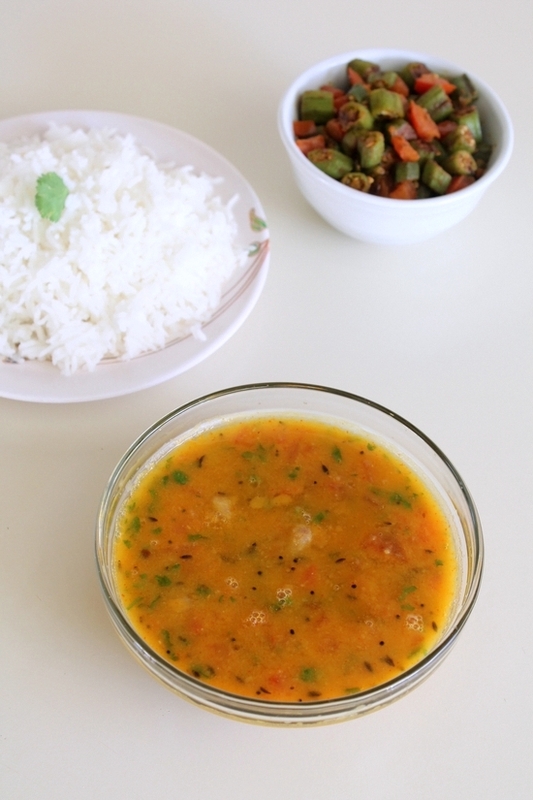 A Gujarati meal is not complete without a bowl of this khatti meethi dal. It is healthy, so you can have it on everyday basis. I make this almost everyday or I can say 4-5 times a week. My grandmom says that when you keep the dal in a bowl for few minutes. Water should float on top and dal should settle at the bottom. If this happens than it is perfect consistency of Gujarati dal. So whenever you serve you need to stir first and then serve in individual bowl. Have a bowl of dal with some plain rice and a papadum on side; it’s like heaven on the earth. Dear husband loves this Gujarati dal, if I give him dal-rice in lunch and dinner every day, he will eat it very happily. 1) Wash toor dal under running cold water till water runs clear. If you have time then soak in enough water for 15-20 minutes. Or you can skip the soaking step. It will be fine. 2) Take dal into pressure cooker. Add 1 cup of water. Now take a small piece of muslin cloth, put peanuts in it and tie it. Make a ‘potli’. Put into pressure cooker. Alternately, go for easy method. Add peanuts into a steel katori or glass and put into the cooker. 3) Cover with the lid, put the weight on. Turn the heat on medium. Let it cook for 6-7 whistles. Then turn off the stove. Let the pressure go down by itself. Then open the lid. 4) Remove the peanuts potli, open it and keep boiled peanuts aside. 5) Now add 2 cups of water to the dal and blend it using immersion hand blender. Traditionally, it is mashed using madani aka Valonu (a wooden whisk). The dal should be smooth, Not single piece of dal in it. Yes, we want the peanuts whole, that’s why we boil them separately. 6) Now add red chili powder, turmeric powder and salt. 7) Stir well, add green chili, grated ginger and chopped tomatoes. 8) Also add jaggery and mix it. 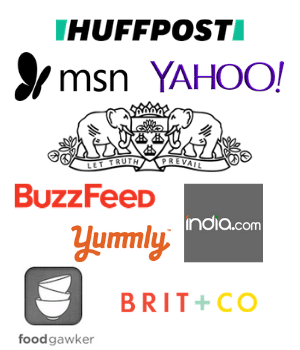 9) Turn the heat on medium. Let the dal boil/simmer for good 10 minutes. If it gets too thick then add splash of water. 10) Meanwhile Let’s make the tadka. Heat the oil in a small tadka pan on medium heat. Once hot add mustard seeds. Let them pop. Then add cumin seeds and fenugreek seeds. Let them sizzle a bit. 11) Now add bay leaf, cinnamon stick, cloves and dried chili. Saute for 30 seconds. You will get nice aroma of spices. 12) Lastly add curry leaves and hing. 13) Immediately add the tempering to the simmering dal. 14) Mix it. Check the consistency. The dal should be thinner (not thick like punjabi dal). Simmer more or less accordingly. Then turn off the stove. 15) Finally add lemon juice, boiled peanuts and chopped coriander leaves. 16) Mix well and dal is ready to serve. If not serving right away, then keep the dal covered. It will thicken as the time goes. Also the watery part with be on top and dal will settle down at the bottom. So at the time of serving, stir the dal first then pour into the individual serving bowl. Using leftover dal, you can make dal dhokli (a one pot meal). Serving suggestion: This Gujarati dal is served with plain rice. You can also serve on side with your roti–sabzi. The dal served during the wedding functions or in the restaurants has slight different taste. They add kharek (dried date) while boiling the dal. Kharek is used instead of jaggery to sweeten the dal. You can use 1 dried date for this recipe. Traditionally dried kokum is used as a sour ingredient instead of lemon juice But it is not available everywhere so I have used lemon juice. If you want to use kokum – add 2-3 pieces of kokum while adding green chili and tomatoes. Taste the dal at the end. If needed you can add some lemon juice. Sometimes kokum does not provide enough sourness. So you may need to use little lemon juice. If you are Jain, then skip the ginger in the recipe. If you have time then soak in enough water for 15-20 minutes. Or you can skip the soaking step. Take dal into pressure cooker. Add 1 cup of water. Now take a small piece of muslin cloth, put peanuts in it and tie it. Make a ‘potli’. Put into pressure cooker. Alternately, add peanuts into a steel katori or glass and put into the cooker. Cover with the lid, put the weight on. Turn the heat on medium. Let it cook for 6-7 whistles. Then turn off the stove. Let the pressure go down by itself. Then open the lid. Remove the peanuts potli, open it and keep boiled peanuts aside. Add 2 cups of water to the boiled dal and blend it using immersion hand blender. Now add red chili powder, turmeric powder and salt. Stir well, add green chili, grated ginger and chopped tomatoes. Also add jaggery and mix it. Turn the heat on medium. Let the dal boil/simmer for good 10 minutes. If it gets too thick then add splash of water. Heat the oil in a small tadka pan on medium heat. Once hot add mustard seeds. Let them pop. Then add cumin seeds and fenugreek seeds. Let them sizzle a bit. Now add bay leaf, cinnamon stick, cloves and dried chili. Saute for 30 seconds. You will get nice aroma of spices. Lastly add curry leaves and hing. Immediately add the tempering to the simmering dal. Finally add lemon juice, boiled peanuts and chopped coriander leaves. Mix well and turn off the stove. Do you have simple recipe for Khaman? (The yellow fluffy cake). here is the instant khaman recipe. This recipe looks great, but I don’t have a pressure cooker. How can I make this in a regular pot or crock pot? Thanks! Yes you can cook the dal in pan on stove top with plenty of water. Only difference is it takes loner to cook in a pan vs pressure cooker.